FALLING into the category of simple books no self-respecting DIY expert should ignore, this is a truly handy little quirky guide to the mysteries of bricolage and home renovation. 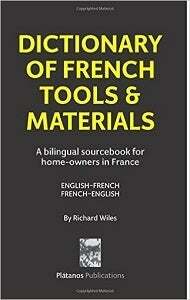 Full of marvellous information on the differences between UK and French tools and materials, there are also strong warnings against importing UK products you already know. Take a coil of plain old copper pipe: it is not the same as the couronne cuivre you get here. French pipe has thicker walls as the water pressure here is generally higher. The old paintbrush gets le French touch, too, as round stock brushes are more common than flat and Richard makes a point from experience that round brushes are easier to use in many areas. With a laudable 10,000 terms translated in both directions, the ‘Useful words’ section loses the book points for including Oui, Non and Bonjour. All in all, it will save hours of frustration and raise a smile.